For a library using UW CORE, need 1000 ng RNA in 50ul sample. 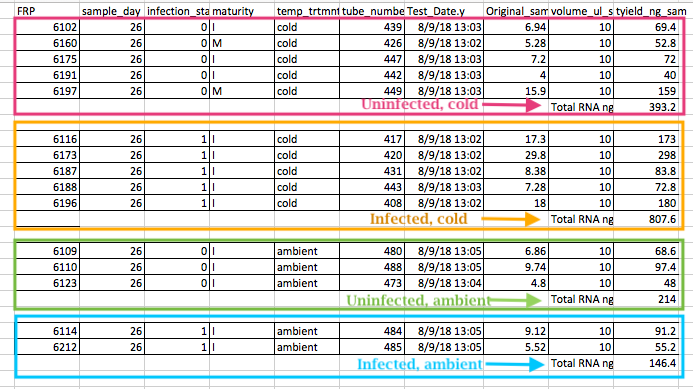 uninfected, cold (11) infected, cold (10) uninfected, ambient (9) infected, ambient (10) (gave uninf. cold instead of uninf. amb. for one sample. not 10 per treatment). Combining the infected cold and infected ambient is very close to 1000ng (954 ng RNA). I added the Qubit RNA HS results from the 40 samples Sam processed. I did this by “left_join” by the tube_number with the 20180813-all-hemo-with-Qubit.csv. Is there a way in R to merge information in “Test_Date.x” with “Test_Date.y” and “Original_sample_conc_ng.ul.x” with “Original_sample_conc_ng.ul.y” so that there aren’t repeats. I’ll have to keep adding more Qubit information as isolations continue. Heads up, this is a bit difficult to work with because your script is traversing multiple repos (e.g. ../project-crab/data ; I don't have a project-crab folder on my computer, so I can't get to those files using your script). Use the download.file() function to download data files from other repos. Add information to repo README.md files that explain that this repo depends on the other and provide link and/or cloning instructions for that other repo.